Based on the perceptions of non-Muslims, this book uncovers the truth about Prophet Muhammad (Pbuh) and explains the reasons for misunderstanding between Islam and the West. It also highlights the prophet’s characteristics and teachings which help to build unity and peace amongst Muslims and other communities. Data was collected by reviewing appreciations of Muhammad (SAW) made by non-Muslims across history and also conducting semi-structured interviews involving contemporary non-Muslim prominent personalities including MPs, Lords, and priests from interfaith communities and chaplaincies of some leading universities. About Dr. Lais – Having developed a career as a Career Adviser providing advice and guidance to students in education, and also achieved a PhD degree which brought me a’ National Research Award’. I have been involved in many studies conducted by universities including Imperial College, University College London and Oxford University. Noticing a literature gap in this topic, I became motivated in conducting a self-funded research and this book is its outcome. Keywords: Prophet, Muhammad, Honesty, Simplicity, Patience, Tolerance, Forgiveness, Care, Compassion, Unity. Dr. Mohammed Abul Lais, having achieved a combined BSc degree in Maths, Physics and Statistics in 1970 underwent several years of formal and informal teachings in Bangladesh and in the UK. He has also worked for a decade in Saudi Arabia and then joined the Camden Career Service in 1992 as a Career Assistant with his base at the Surma Community Centre, under Camden Education Department. He did a Post Graduate Diploma in Careers Guidance (PG Dip CG) from East London University in 1995 and became a qualified Careers Officer. He noticed that many Bangladeshi children cannot utilise their fullest potential in education because of the inadequate support from the National Curriculum. As a result they are failing in exams and are labelled as underachievers in education. To address this reality and support many Bangladeshi children in education he embarked on a PhD study while leaving the careers service and joining Imperial College as a Research Officer. He completed his PhD in 2004 which was a breakthrough for a great majority of Bangladeshi children in the UK. This achievement earned him two awards from the Bangladeshi Community in Camden, where he lived with his family for some 40 years. One of these awards was jointly from B.E.C, R.P.B.P.T.A, R.P.A, B.C.G and C.B.C.S and another from B.W.A. He moved to University College London in 2005 and received a FRSA’ Award in the same year and a National Research Award in 2006. He was involved in many university research projects including Oxford, City, Queen Mary, Edinburgh etc. Muhammad (SAW): 1001 Universal Appreciations and Interfaith Understanding and Peace. Such a large compilation of appreciations of the prophet is something attempted for the first time in history. Dr. Lais received another Award at the House of Lords for outstanding performance through this book from the Right Honourable Lord Nazir Ahmed on behalf of International Imam Hussain Council, in May 2014. Dr. Lais is the second eldest amongst nine siblings most of whom live in the UK. His wife Momtaz Lais has worked as a bilingual assistant in the Education Department, Camden, UK. They have four children: Kalam Lais, B.SC Honours in Information System and Senior Systems Officer Specialising in Software testing; Samira Lais, Psychology graduate and an Assistant Head Teacher in the London Borough of Newham; Shahana Lais, Psychology graduate and a Research Officer at Queen Mary College, University of London and Hasnet Lais, having a postgraduate degree working as a History Teacher in a secondary school. Their son in –law (Shahana’s husband), Yousuf Goni, an IT graduate, works as a Training Manager in the London Borough of Tower Hamlets. They have four grand children: Nousheen, Raiyan, Suraiya and Najah. This book is a real eye-openerJust finished reading this and I couldn’t help but feel how limited my knowledge of Muhammad was up until this point. Considering how influential he was and continues to be for over a billion people in the world, it amazes me how millions of supposedly educated people choose to live in wilful ignorance of one of history’s most enigmatic figures. This book left a lasting impression on me primarily due to Dr Lais’s intention to dispel all the Orientalist fabrications and hysteria surrounding Muhammad. I’m pleased he felt the theme of tolerance to be pressing enough to inspire him to write a book on the subject by linking it to a man who has been grossly misunderstood. Ignorance breeds intolerance and hatred which is why a book like this is crucial to reinstating civility among people. Humanity appears to have lost many core values which are necessary for peace and with tolerance being essential to positive social relations, the author must be commended for making the mutual understanding between faith and non-faith communities a focal objective of his research. 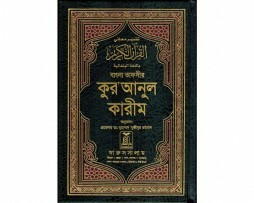 It is an interpretation of the meanings of the Quran in the Bengali language. The Persian script is in the large Arabic writing along with the Bengali translation on the left side with notes on the bottom. The official language of the Bangladesh is Bengali. 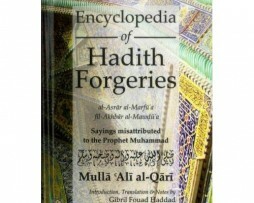 The first comprehensive catalogue and study of hadith forgeries in English. Beacon Books is proud to commence our publishing programme with the launch of The Encyclopedia of Hadith Forgeries by Mullah Ali al Qari translated by Dr Gibril Fouad Haddad.This 740 page hard back book has been over 10 years in the making and is the first comprehensive catalogue and study of hadith forgeries in the English language. The Lifting of Secrets Concerning Forged Re­ports was written over four hundred years ago by a respected and prolific Meccan savant of Afghan origin. Mulla ‛Ali al-Qari (d. 1014/1605) was thor­oughly famil­iar with the large body of critical lit­erature on hadith forgery, which he re­fined and re­or­dered alpha­beti­cally into 625 entries. Al-Qari’s last work, it is the only catalogue of for­geries with both a transmission-based and content-based critique, illustrating the author’s vast erudition as well as his lenient choices in hadith metho­dology and his classic Hanafi and Sufi views. 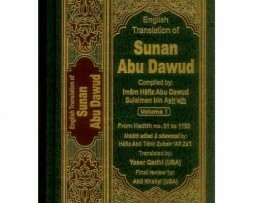 English Translation Of Sunan Abu Dawood (5 Vol. Set) By Abu Ammar Yasir Qadhi New edition of Sunan Abu Dawood in 5 volumes by Dar-us-Salam with commentary after each hadith. Unlike other prints, this edition has crisp and clear printing in deluxe 6×9″ bounding. Like the other translations of the six books of hadith, Dar-us-Salam Publications, has taken great care in correct translation, simple and clear modern English language, and high quality publishing. Ahadith in the book are followed by comments to explain issues and to help readers derive lessons. To aid readers further, Dar-us-Salam, has added several features like section on how to benefit from Sunan Abi Dawud, about the Arabic and technical terms used, information about the hadith compilations and a glossary of Islamic terms in the last volume. Each hadith is also followed by its status in regards to the authenticity. The status is explained more in detail in the Arabic text. The chain is also complete in the Arabic text while it is removed from the English to reduce the length and not being of much benefit to the English readers.